Red Bull has released a new video of Felix Baumgartner’s skydive when he jumped from a height of 24 miles last year and broke the sound barrier. The jump, sponsored by the Austrian energy drink manufacturer, was shown in different angles in the latest video, which also carried Baumgartner’s vital real-time statistics like airspeed, altitude, and G-force load as he free falls from the stratosphere. Baumgartner took a balloon up to the height of 24 miles (39 kilometers) before jumping out of the capsule on October 14, 2012. He was protected by a pressure suit, which is needed at the velocity that he was going at. In the video, Baumgartner accelerates to 435 miles/hr [700 km/hr] in 20 seconds, eventually reaching terminal velocity where acceleration stops and he starts cruising at 120 miles/hr [200 km/hr]. Speaking to the media after the jump last year in New Mexico, Baumgartner reflected, “It was harder than I expected. Trust me, when you stand up there on top of the world, you become so humble. During the initial stages after the jump, personnel in the command center held their breath when Baumgartner began spinning uncontrollably in the air. “When I was spinning the first 10, 20 seconds, I never thought I was going to lose my life but I was disappointed because I’m going to lose my record. I put seven years of my life into this. “In that situation, when you spin around, it’s like hell and you don’t know if you can get out of that spin or not. Of course it was terrifying. I was fighting all the way down because I knew that there must be a moment where I can handle it,” he said. The 43-year-old Austrian daredevil was supposed to jump from 36,500 meters but this changed to 39,000 meters. He broke the record set by Joe Kittinger who jumped 31,333 meters back in 1960. Overcoming claustrophobia while in the pressurized suit, Baumgartner is the first human to break the sound barrier outside of a vehicle. He has also performed death-defying jumps from the Petronas Tower in Kuala Lumpur, Malaysia, in 1999 and from the observation deck of the 91st floor of Taipei 101 in 2007. “A licensed gas balloon pilot, he has earned private helicopter licenses in Austria and the United States, as well as a commercial European helicopter license, and he is an advocate for the nonprofit Wings for Life Spinal Cord Research Foundation. 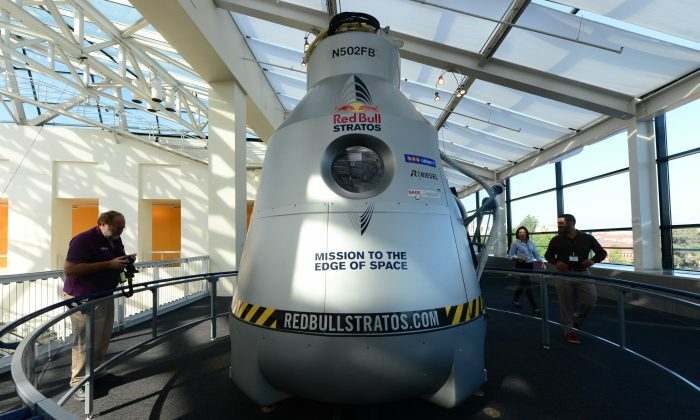 In training for Red Bull Stratos, Felix divides his time between Switzerland and the United States, but, he says, “The air is where I am at home,” according to redbullstratos.com. Baumgartner is a busy man these days chatting with James Cameron about the acclaimed director’s trip down to the bottom of the Mariana Trench and with Tom Cruise about the future of space travel. Click here for a documentary showcasing Baumgartner’s and his team prepare as they head out for the challenge.